I got this record as a birthday present a year and a half ago and, I hadn't listened to it until now. Truth is that I'm not a big Righteous Brothers fan, although I do like their recording of "Unchained Melody", which is on this record. 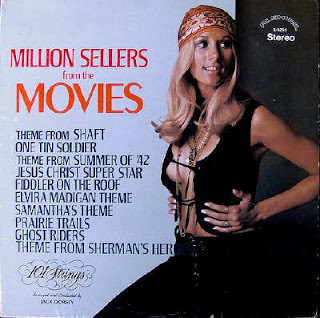 I was really surprised when I saw that Phil Spector was the producer (Bill Medley was also producer) and that this record was on his record label, Philles Records. Those were better days for old Phil. Those were also better days for the Righteous Brothers, since Bobby Hatfield sadly passed away in 2003 due to a cocaine overdose. Anyway, enough of the sad stuff. 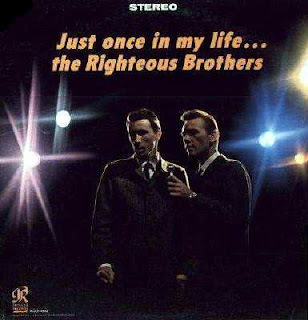 Give a listen to some good music and good vocal performances by Bill Medley and Bobby Hatfield - the Righteous Brothers. This is an album I've had for quite some time - bought it for the cover and had it hanging on my wall for almost as long as I've had it. I really love that cover - very simple, yet elegant and sophisticated. I'll probably end up hanging it back up because I like it so much! The album itself is good background music - nice, unobtrusive, good to read by or have a quiet dinner. If you like music performed by this kind of trio (piano, guitar, bass), then you'll like this one. 4. Oh, What A Beautiful Mornin'! Here's another 50-cent gem I picked up out of the HPB bargain bin - and it was still sealed! I must admit that it was the cover that caught my eye. Nice, er, uh...scarf - on her head. Yeah, yeah. That's it. The music itself is familiar - themes from movies from the early 1970s (although I've only heard about half of these myself), and it's played "with the Big Sound of the magnificent '101' Strings orchestra". I was a little surprised that 101 Strings could rock a little on "Superstar". The next time I watch "Jesus Christ Superstar", I'm sure that the 101 Strings version of the song will be the one that sticks in my head. Really, I do like 101 Strings. I just wish I had more of their albums! Anyone out there want to share some? 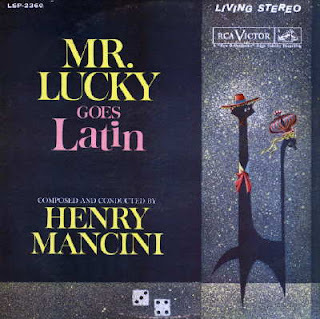 Here's a great album from one of my favorites, Henry Mancini. In my opinion, he can do no wrong. I got this for only 50 cents from the HPB bargain bin - what a steal! Besides the great music on this album - what a great cover! 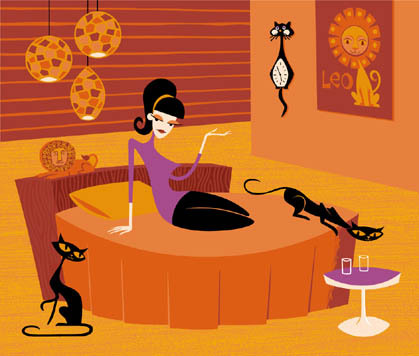 Love the cat! (For those of you who want to know, the cover was designed by Don Peters.) I really don't have much to say about this album except that it is really great! So, without further ado, go get it now! Time for my favorite singing husband and wife team - Steve Lawrence and Eydie Gorme. These two always bring a smile to my face! And this album will bring a smile to your face because it's full of great songs from great Broadway shows such as "Camelot", "Bye Bye Birdie", "Music Man", and "Li'l Abner". Once again, I picked this up from the HPB bargain bin. I only wish this was the stereo version; this is the mono version but still has great sound. Unfortunately, several of the songs do have some skips, most of which are barely noticeable except for "Til Tomorrow", which has several noticeable skips. If anyone out there has a better rip of this album (stereo, and no skips), please do share! This is another album I've had for a number of years, ever since I was into the ballroom dancing thing. Every song on this album is great. But then again, it's Bert Kaempfert! What did you expect? It is quite delightful to listen to, and a great dance album, too! These are all instrumental fox trots, for those of you who know how to dance the fox trot or want to learn. About half the songs were written by Bert Kaempfert, and the other half are well-known arrangements of his. All trumpet solos are by Fred Moch, excepting for selection "Wonderland By Night," trumpet soloist is Charles Tabor. The album also says "Recorded in Europe". Start dancing! Jonah Jones - the trumpet man with the catchiest sound of all - goes rompin' on the Hollywood sound stages, swingin' the cinema's greatest songs.... 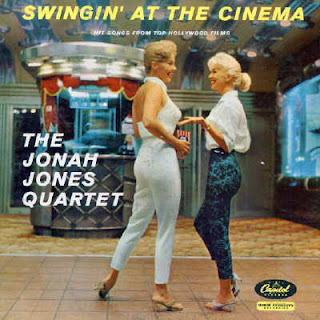 In Swingin' at the Cinema, the Jonah Jones Quartet has gathered a perfect set of songs to display the rich repertoire of Hollywood film music. And with Jonah's revealing handling the melodies stand out in sharp relief, becoming new evidence of the wealth of music the films have produced. They're all brilliantly showcased by the quartet's approach and, in particular, by that jaunty man at the helm, Jonah Jones. How about a little jazz tonight? This is an album I've had for a number of years but never listened to until now. I bought it for the cover, framed it, and had it hanging on my wall up until about a year ago, when I finally switched out some of my framed albums. 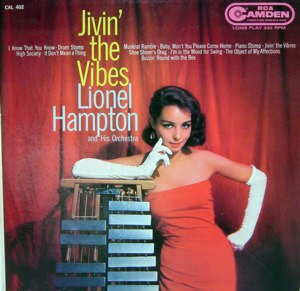 Anyway, if you like Lionel Hampton, you should like this album. 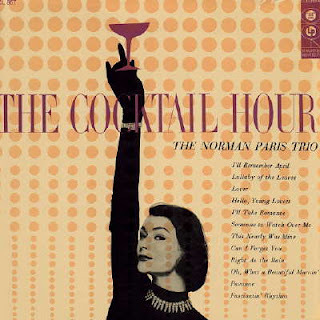 This was released in 1957, but the songs were all recorded from 1937 to 1939, per the liner notes. And there are all sorts of other famous musicians that accompany Lionel on these songs - mostly from other famous orchestras of the day. Enjoy!